Shop everywhere Visa is accepted. PAUSE and RESUME your RushCard with Pause Protection.19 Learn More. Get your paycheck and benefits up to 2 days sooner with Direct Deposit.2 No more check-cashing fees or lines. Shop at stores. Buy online. Set up recurring debit card payments. 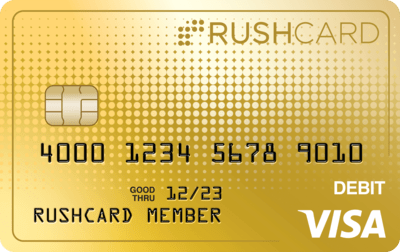 Use your RushCard everywhere Visa is accepted. Download our app 18 and set up Text Alerts to manage your money on the go. 3 Securely log in with your fingerprint. You are ready to start using your RushCard. Pay bills online, set up RushGoals to save for a rainy day, and so much more. We provide access, safety, and convenience to help our members get ahead. Always on the go! We know our members are never standing still so we put the control squarely in your hands with the RushCard Mobile App.18 Now available on iPhone and Android devices. Not a RushCard member? Get a RushCard.